A commenter asked a question before I left on vacation. I gave him a brief answer as a reply, but now I want to go into the details of my answer. As the commenter mentioned, he was doing research for a sermon and came upon some information that indicated the sun is shrinking at a rate of about 5 feet per hour. While that’s not a lot for something as big as the sun, it indicates that the sun is rather young. 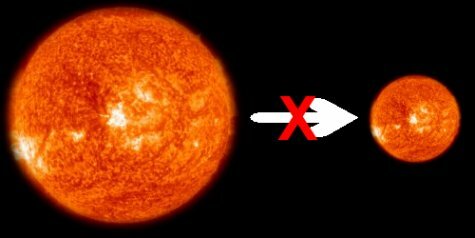 After all, if we extrapolate the sun’s size backward over time using that rate, we would find that the sun would have been touching the earth a “mere” 11 million years ago. If this were true, it would be a clear indicator that the earth and sun are not billions of years old. After all, the earth would not be a haven for life if it were anywhere near the surface of the sun! So if the sun is (and always has been) shrinking at anywhere near a rate of 5 feet per hour, the earth and sun could not be very old. The problem is that this argument is based on faulty ideas about where the sun gets its energy and, more importantly, it is based on faulty data. Since this blog is all about what the data say, let’s start with that. In 1979, two astronomers (J. A. Eddy and A. A. Boornazian) gave a talk at the annual meeting of the American Astronomical Society. In their talk, they looked at data from the Royal Greenwich Observatory that were gathered from 1836 to 1953. Based on those data, they concluded that for the time period in question, the sun was shrinking at a rate equivalent to about 5 feet per hour.1 Those are the data that formed the basis of the “shrinking sun” argument. However, you have to realize that the data were presented at a scientific meeting, and they were never fully published. This indicates that the data were quite tentative. Annual meetings are held by many scientific societies, and their purpose is for scientists to share what they are currently working on. Part of the reason scientists get together to share their results is so that others working in the same field can help them interpret their data, show them how their data could be improved, or point out flaws in their data. Since these startling data were never published in a peer-reviewed journal, you can bet that someone (either in the meeting or later on) pointed out their flaws. Obviously, the data did cause quite a bit of stir. Indeed, in less than a year, Sofia and colleagues published a report in Science that examined both the Royal Greenwich Observatory data and other data related to the size of the sun. They concluded that, at most, the sun was shrinking at a rate of just over 1 foot per year.2 About a year after Eddy and Boornazian had given their talk, Irwin Shapiro published a report in Science that measured the size of the sun by looking at how long it took Mercury to transit across it. The data spanned from 1736 to 1973, and within the error of the measurements, there was no shrinkage throughout that entire period.3 The following graph makes this point very clearly. The circles and triangles with error bars are the data, while the dashed line is the shrinking that was supposedly measured by Eddy and Boornazian. Measured change in sun size. A horizontal line would indicate no change. The dashed line is the supposed shrinkiage measured by Eddy and Boornazian. From reference 3. Clearly, then, the data from Eddy and Boornazian are simply not correct. The sun is definitely not shrinking. From a theoretical point of view, the concept of a shrinking sun is pleasing to those who think that the sun is powered, at least in part, by gravitational collapse. While it has been known for some time that nuclear fusion provides most of the sun’s power, details regarding certain particles that come from the sun (solar neutrinos) indicated that nuclear fusion might not explain all the energy coming from the sun. As a result, gravitational collapse, which would cause the sun to shrink, could have been considered as a secondary means by which the sun produced energy. However, recent experiments have explained this apparent problem, so according to the most recent data, all of the sun’s power can be explained by nuclear fusion.4 As a result, there is just no reason to expect that the sun is shrinking. Given the fact that the data clearly speak against a shrinking sun, and given the fact that there is no reason to think the sun is shrinking in order to produce the energy that comes from it, the idea that the sun is shrinking is not reasonable. Despite the fact that the shrinking sun is not a reasonable argument for the idea that the sun is young, there is at least one other data set that indicates the sun is not billions of years old. 1. J. A. Eddy and A. 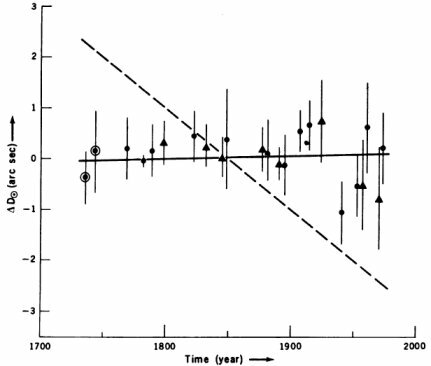 A. Boornazian, “Secular Decrease in the Solar Diameter, 1836-1953,” Bulletin of the American Astronomical Society 11:437, 1979. 2. S. Sofia, J. O’Keefe, J. B. Lesh, and A. S. Endal, “Solar Constant: Constraints on Possible Variations Derived from Solar Diameter Measurements,” Science 204:1306-1308, 1979. 3. Irwin Shapiro, “Is the Sun Shrinking?”, Science 208:51-53, 1980. 4. Arthur B. McDonald, Joshua B. Klein and David L. Wark, “Solving the Solar Neutrino Problem”, Scientific American, 288:40–49, April 2003. What do you think about current stellar evolution models that seem to indicate our sun is very old? Based on our current understanding of the life cycles of stars, the sun is a main sequence star that is supposedly around 4.6 billion years old. How reliable do you consider this result to be? Also, wouldn’t the “metallicity” of the sun indicate its age? Thanks for the question, Dan. Like biological evolution, I think stellar evolution reads far too much into the data. Certainly, there are different kinds of stars. Some of them could be understood in terms of different stages of development. For example, there is a reasonable physical mechanism proposed by which some main sequence stars (like our sun) would become red giant branch stars if enough time elapsed so that their cores became significantly depleted of hydrogen. However, like biological evolution, we have no direct evidence that this happens. In addition, there are some problems with the entire picture of stellar evolution. For example, we don’t understand why there are no population III stars. There are also stars that are out of place if stellar evolution is true. There are also certain types of stars that don’t really fit. None of these problems mean that parts of the stellar evolution view are incorrect. However, in the absence of direct evidence, these problems do make one question the overall validity of the concept. The “metallicity” of a star is only an indication of its age if we know it started out as mostly hydrogen. If we knew that to be the case, then yes, the more heavy elements in the star, the longer it must have been fusing lighter elements. However, remember that the metallicity problem is the reason population III stars were invented. Even the supposedly “youngest” stars we see today have heavy elements in them. However, infant stars should not. To get around this problem, stellar evolutionists had to come up with a type of star that has never been observed – population III stars. You did say that you’d look at some of the evidence for an old earth, and debunking a few misconceptions about evidence (such as moon dust) would make for some interesting reads as well. While the sun might be warming up as it goes along such that it couldn’t support life (as we know it) all that time ago, does that necessarily preclude the sun itself from being that old? Thanks for reminding me of that, Josiah. I have a few other things I want to blog on first, but I will definitely do that. The temperature variation of the sun over its lifetime does not mean the sun itself is young. However, it does mean the earth/sun/life system cannot be billions of years old, unless there was some perfectly coordinated way in which the earth became less efficient at absorbing the sun’s heat over time. For example, you could imagine that the earth/sun/life system could work for billions of years if the earth started out closer to the sun. Then, as the sun grew hotter over time, the earth marched away from the sun at just the right pace. However, the most reasonable explanation is that the earth/sun/life system is not billions of years old. Thanks for your answers, Dr. Jay. If mainstream stellar evolution is questionable, then is there any other way to understand the physics of the sun in a short time-scale? In other words, is there a scientifically viable young-sun model that could explain its life cycle and current state? I am happy to answer questions, Dan. It is probably one of my favorite things to do. I am not sure what you mean by a young-earth model that explains the sun’s lifecycle and current state. The young-earth view of the sun is that it was created specifically for the earth. There is some evidence to suggest this, as the sun is much less prone to violent eruptions than other stars of roughly the same size, brightness, and composition (Seife, C., “Thank our lucky star,” New Scientist 161:15, 1999). Thus, it was created with roughly its current mix of elements and roughly its current state. If you could be more specific in what you mean, I might be able to help more. I’m glad you like answering questions, since I like asking them, as you already know! I’m not asking about a young earth model that explains the sun’s life cycle and current state, but rather a model of the sun itself. In other words, if we look at the sun, is there a way we can understand its mass, chemical composition, etc. in a short time scale framework that is consistent with what we know about physics? Or do we have to postulate that God created the sun “as is”? I guess a related question concerns the earth itself. Geologists generally assume that the formation of the earth required millions of years of processes (during the “Hadean” Eon) in order for earth to cool from a molten state. How can we explain the formation of the earth within a short time frame? Are we required to postulate a different model of earth formation, such as Humphreys’s model that explains planetary magnetic fields? Dan, I think you have to postulate the sun being created as is, since it was created to immediately sustain life. In some sort of evolutionary model, the sun needn’t support life right away, so it can start as just a cool cloud of gas that attracts more gas to itself until the gravitational collapse starts fusion. However, such a star would not sustain life on a planet. In the same way, since the earth was created to support life right away, its formation needs to be modeled in a way that requires supernatural intervention. This is the big issue in science…how much do you have to hold to a naturalistic view? It is important to strive to explain things naturalistically, as that gives you the most explanatory power. However, as Dr. Hunter and Dr. Monton point out, if supernatural intervention DID occur, it is important to account for that in any serious scientific paradigm. Developing a naturalistic model that gives explanatory power is useless if the explanation ends up being wrong. Please note that not all scientists agree with that statement. Some say it is irrelevant whether or not our scientific models are correct. As long as they are consistent with the data, that’s all that matters. I disagree. Science should search for the PROPER explanation for why the universe looks the way it does. I think the way you develop models that properly take into account supernatural intervention is demonstrated by Dr. Humphreys’s planetary field model. That model incorporates supernatural intervention, but it provides a way to check whether or not it is correct by giving several predictions regarding the data. I recently came across your blog while looking into Apologia materials for my family homeschooling (which I have decided to use). In any event, I appreciate your candid and open approach to scientific questions. Frankly, too many Christians seem to start with their presuppositions and try to force the evidence to fit their mold, rather than being honest with the data when it conflicts with their views. I haven’t read a lot of your material but it appears that you lean towards the young-earth position. I wonder if you are familiar with Dr. Hugh Ross and Reasons to Believe? I have followed their ministry for several years and appreciate they way they approach the Bible and science. Thanks for the good work, and may the Lord guide you in all things! David, I couldn’t agree with you more when it comes to how many Christians deal with the evidence. In fact, I would add one other thing – they steadfastly ignore both history and theology so as not to have defend their position seriously. I am very familiar with Dr. Ross and his ministry. I have several of his books. I disagree with him on the age of the earth and certain aspects of his theology, but I have learned a lot from his organization. For example, if I had not read his books and checked his references, I would not have known that the nature of the creation account has been in dispute from the beginning of Christendom. I had, unfortunately, been convinced by a falsehood that some young-earth creationists teach – that the church unanimously believed the days in Genesis were 24-hour days until evolution and “millions of years” came along. That, of course, is 100% false, and it was Dr. Ross’s works that first indicated it to me. I also deeply appreciate Dr. Ross’s emphasis on the design you see in nature. Thank you for taking the time to respond. I agree that an ignorance of history is a real problem among Christians today. I don’t think we should fit our views to conform to historical understandings, but on the other hand, we need humility to learn from our forefathers’ understanding of various issues. I’m glad you’re familiar with Reasons to Believe and that you have benefited from some of their information. If you care to share, I would be very interested in hearing specifics of where you think they misread the evidence regarding the age of the earth, as well as the theological differences you mention. One thing I greatly appreciate about Dr. Ross is his calm and dispassionate approach. I’ve never seen him ruffled, in contrast to many of his young-earth critics who have demonized him and his ministry. In looking at your “Links to Investigate” on the sidebar, you have a rather disparate assortment! Have you considered adding Reasons to Believe to your links? I think theirs is an important voice in this discussion, and many Christians are still unfamiliar with their work. Just a thought…. Hello again David. Your point is very well taken. Somehow, many people think that only today’s Christians are “enlightened.” As a result, they don’t bother to learn the wisdom of those who have come before us. You can read some of my disagreements with Reasons to Believe on this blog. For example, they consider the idea that radioactive half-lives are constant to be a sure thing, even though the experimental data clearly say otherwise. They also discount what I consider the most relevant data regarding the age of the earth. In addition, I don’t think they properly consider the huge, unwarranted extrapolation that is necessary in order to believe in an ancient earth. I agree with you that while many young-earthers are decidedly nonChristian in their treatment of Dr. Ross, I have never seen Dr. Ross return such treatment in kind. That speaks volumes for him. I do think I have the old-earth creationist view well represented in my links (remember – most intelligent designers are old-earthers), but I will consider it.